December 1, 2014 — ONTARIO BINGO HALLS & GAMING CENTRES HOPE YOU CAN CELEBRATE SOME OF THE HOLIDAYS WITH THEM BY OFFERING SOME VERY SPECIAL EVENTS AND PRIZES! Remember, you can also find Holiday Hours on each advertiser’s unique page. Just use the Menu Bar above to find a location near you now. We are also slated to deliver our new January 2015 issue in time for your Christmas Break — on MONDAY, DECEMBER 22nd. Advertising Bingo Halls and Gaming Centres will have fuller “NEW YEAR’S EVE” details in that issue. However, basic NYE info can be found right now on individual Gaming Centre listings. We hope that you and yours will have a fantastic and safe Christmas, Chanukah, Kwanzaa, Festivus or Holiday Break!!! Thank you for playing Bingo when you can and for continuing to show your support of Bingo Player Magazine. We also hope that you will continue to show your support of the many Sponsors, Charitable and Not-For-Profit groups who raise funds when you support Bingo and E-Gaming activities in your favourite Ontario Charitable Gaming Centres. November 1, 2014 — ONTARIO BINGO GAMING CENTRES WELCOME YOU THIS FALL! Tuesday, November 11th is Remembrance Day. With all the activity in Ottawa over the past weeks, never have we been reminded more about the efforts of Canadian Forces and the role of the Legion. We hope you will support the annual Poppy Drive. It’s a small gesture that sends a big message. 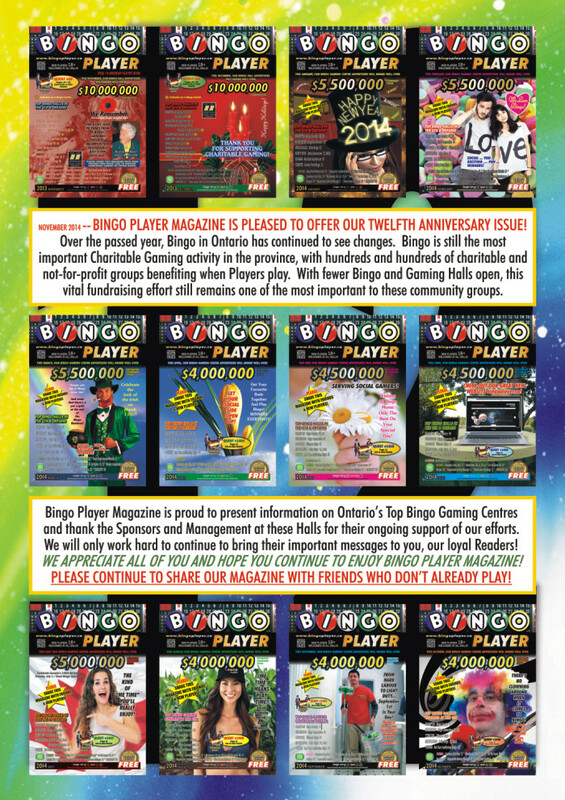 BINGO PLAYER MAGAZINE is also happy to celebrate our 12th Anniversary with our November ’14 issue. No doubt, this has been a difficult year for the Bingo industry in Ontario, but we continue to do what we do best — talk about and share great Bingo and Gaming opportunities for Players and new Players. Our website also continues to spread the word and attract visitors from Ontario and around the world. We also are very grateful to have the undeniable support of the Sponsors and charitable groups in Halls that still look for feedback from such amazing people. Delta Bingo Mississauga also wanted to remind you they have a $27,000 Friday and Saturday 7pm opportunity. CLICK HERE for more information. ENJOY YOUR FAVOURITE GAMES!!! October 23, 2014 — THE BINGO CONNECTION IN BURLINGTON IS OFFERING STILL ANOTHER “SPECIAL MINI-MONSTER BINGO” AND YOU’LL ONLY HEAR ABOUT IT HERE! Sunday, October 26th at 6:30pm, Burlington’s Bingo Connection will be the place to be for a fun, “Mini-Monster” Bingo — with 6X $1,000 Guaranteed Jackpots and more. Click here to see their page now!!! October 1, 2014 — ONTARIO BINGO HALL SPONSORS SAY “THANKS FOR GIVING” AND HOPE YOU’LL COME AND PARTY FOR HALLOWE’EN! Monday, October 13th is our Thanksgiving Holiday in Ontario. We’ve included any “Specials” in Bingo Hall and E-Bingo Gaming Centre advertisements. Use the pull-down menus above to find a great Centre near you. There are also Special Draws and/or Costume Contests happening on Friday, October 31st. What better way to have the best time than playing your favourite Game, partying with friends and family — and maybe winning a bundle. ENJOY!!! September 29, 2014 — THE BINGO CONNECTION IN BURLINGTON IS OFFERING ANOTHER “SPECIAL MINI-MONSTER BINGO” AND YOU’LL ONLY HEAR ABOUT IT HERE! Sunday, October 5th at 6:30pm, Burlington’s Bingo Connection will be the place to be for a fun, “Mini-Monster” Bingo — with 6X $1,000 Guaranteed Jackpots and more. Click here to see their page now!!! September 1, 2014 — THE FIRST OF SEPTEMBER MAY BE YOUR DAY (OR NIGHT) TO REMEMBER AT BINGO! Labour Day is upon us and we all deserve a nice break. If you like entertainment and the chance to win, Bingo is a great game to play! Monday the 1st (the actual Holiday), you can find great Bingo Specials and Promotions that will help you enjoy the day even more!! There’s also a huge promotion going on at Delta Bingo Mississauga. They are giving away a new CHEVY CRUZE. You have several weeks to enter, plus there will be extra chances to go on to the main event and (maybe) win that Car! Click here to see their page now!!! August 4, 2014 — TODAY IS SIMCOE DAY! IF IT’S A DAY OFF FOR YOU, WE HOPE YOU’RE PLAYING A FEW EXTRA SESSIONS OF BINGO – YOUR FAVOURITE GAME! Many of our advertising Bingo Halls and Gaming Centres have specials going to make this day even more special. Pick a Hall or Gaming Centre from our listings on the main toolbar at the top of this page. August 1, 2014 — THE SUMMER MAY BE WINDING UP, BUT THE BINGO SPECIALS AND OFFERS ARE BETTER THAN EVER! We want to thank you, on behalf of the hundreds of Charitable and Not-For-Profit groups who benefit when you play Bingo. Summer time is usually coveted, but the work that these groups does not stop just because the weather is excellent. In fact, some of the groups do their best work with people at this time of year. Pick a Hall or Gaming Centre location from those on the toolbar at the top of this page. Again, THANK YOU! July 1, 2014 — ARE YOU INTERESTED IN TRYING THE NEW E-BINGO AND E-GAMING? WHY NOT TRY ONE OF THE BEST — RAMA GAMING CENTRE MISSISSAUGA! Rama Gaming Centre has one of the most beautiful and modern E-Gaming / E-Bingo locations in Ontario. You can also follow the World Cup Soccer games while you play your favourite games. July 1, 2014 — CELEBRATE CANADA DAY PLAYING BINGO! Tuesday, July 1st is Canada’s Birthday Celebration. Many Ontario Bingo Gaming Centres will be offering specials and more. DID YOU KNOW … As a country, we are 146 years old officially on July 12th. June 6, 2014 — THIS JUST IN … ULTIMATE BINGO IS OFFERING 7 x $2,000 & 7 x $1,000 SATURDAY NIGHTS AT 7pm!! In total, Ultimate Bingo is offering a $24,000 Program Saturday nights at 7pm. CLICK HERE to see the Program! June 3, 2014 — THIS JUST IN … BINGO CONNECTION IS OFFERING $1 BARGAIN BOOKS ON SATURDAY, JUNE 7th @ THE MATINEE SESSION ONLY!! Please note that no “Bingo Connection $5 Coupon” will be accepted on this special. However, you can use your “Bingo Connection $5 Coupon” towards a TED purchase. June 1, 2014 — COOL DOWN THIS SUMMER AT AN AIR-CONDITIONED ONTARIO BINGO & GAMING CENTRE!! It’s good to know that you can spend a few hours cooling off at an Ontario Bingo or E-Bingo Gaming Centre. Also keep in mind that Sunday, June 15th is FATHER’S DAY. We hope you’ll show your Dad a new way to have fun (if he doesn’t know, already). Many Halls and Gaming Centres may even have a free, Father’s Day bingo dabber to help him celebrate. May 20, 2014 — THANK YOU FOR YOUR PATIENCE WHILE WE’VE UPDATED OUR WEBSITE! WE’RE PROUD OF THE WORK AND RESULTS AND HOPE YOU ARE, TOO!! Well, the tinkering is done and we’re thrilled with the new website’s look and feel. It’s modern and fresh. It moves. It’s unbelievably easy to navigate. In fact, if you still use a mouse, every bit of information is literally one “click” away. That’s not to say the website is not “touch-friendly”, because it is. It’s built using such a device (just to make sure). The website is also scalable (mostly), which means it will be much more “mobile-friendly”. We’ll test things more over the coming weeks and months. The individual Hall and Gaming Centre pages are clean and clear, with very useful links (try the “CLICK HERE TO GET DIRECTIONS FROM WHERE YOU ARE”)! We also have links to the Sponsors who benefit from Bingo – everyone’s favourite form of Charitable Gaming!! Plus, all our monthly magazine content is just a click away — including monthly features, like recipes and puzzles, which may only appear on our website. You’ll find all that under “FEATURES“. We’re also looking to add some more social networking platforms, like Facebook and Twitter, so that we may facilitate update information quicker and better. You’ll see we’ve already got the icons just on the right side of this page. It is extremely rare that information we’ve printed in the magazine needs updating or correction, but many Halls use these platforms wisely, to help get your Jackpot information and game information updates out for the next session. Many also use these platforms as great “reminder” systems. As we mentioned in our last post, some of our historical content is still being converted to our new website layout, the most important information is now current and fresh. We appreciate everyone’s patience while we’ve been updating. Please remember to update your older Bingo Player bookmarks with our new pages. WELCOME BACK! May 16, 2014 — While some of our historical content is still being converted to our new website layout, the majority of the information is now current and fresh. We’ve also added the contact details, daily Bingo Schedules (for each location), Google map feature, Google map directions feature and links to the Sponsors (charitable or not-for-profit groups) who benefit when you play Bingo. May 6, 2014 — We are proud to be re-launching and working on our new, modern website design. It may take some time to rebuild all of our great content (including items posted in the past), so please be patient with us. Bingo Player is (and has always been) very proud to represent and help promote Bingo and E-Gaming Centres in Ontario. April 30, 2014 — We apologize for updating issues on our website. Technology issues have forced us to completely rebuild our website. However, we are migrating to a better delivery platform and expect to have modern features moving forward. Thank you (especially to our advertisers) for your patience. We hope you like the new site when it launches shortly. April 1, 2014 — NO JOKING, PLAYING BINGO IS LOTS OF FUN! We are proud to be re-launching and working on our new, modern website design. It may take some time to rebuild all of our great content (including items posted in the past), so please be patient with us. Bingo Player is (and has always been) very proud to represent and help promote Bingo and E-Gaming Centres in Ontario. March 1, 2014 — PLAYERS FIND LUCK EVERY DAY AT LOCAL ONTARIO BINGO AND GAMING CENTRES! We hope you find your luck this month — or at least the “Luck of the Irish” on St. Patrick’s Day. As any Ontario resident knows, this has been a particularly hard winter and Bingo Centres have had an even more difficult time. We hope, if you can, that you’ll try playing Bingo and discover how much fun the games are. We also hope you’ll tell your friends to try Bingo and visit our Bingo Player Magazine advertisers. Thank you!! Also, sadly, Variety Trent Bingo in Scarborough will close their doors officially after the last Session on March 31st. After more than 25 years, with some Staff having been at the Hall for decades and more, there will be a lot of “Must-Go” Jackpots to win. Regular daily Sessions will continue until the last Session, so please stop by and say your “goodbyes”. February 26, 2014 — WE ARE HEARTBROKEN TO ANNOUNCE THE PASSING OF OUR FRIEND, MR. LEN PETERS … Len was a good friend and a good neighbour. Len was just shy of 94. Our condolences to his wife of 68 years, Eva – and to his three sons, Allan, John & Terry, and their families. Len was the oldest, original resident on his peaceful street in Scarborough and we will all miss him very much. February 1, 2014 — FIND OUT IF YOU LOVE BINGO THIS FEBRUARY! Ontario Bingo Halls and E-Gaming Centres are inviting new Players to check them out. Tell them BINGO PLAYER SENT YOU and you might get a special, “welcome” treat. See the head Session Manager. January 1, 2014 — HAPPY NEW YEAR, BINGO PLAYERS! We wanted to wish you and yours only the best in 2014. We also wanted to thank each of our Bingo & Gaming Centre advertisers and their many, many Sponsors for your ongoing support of our efforts — even during more difficult times. We hope all our Readers and Web Guests will tell everyone they know that “Bingo is the best”!